Gabriella Neal spent weeks working in the Sikh community, learning about many truths and misconceptions. 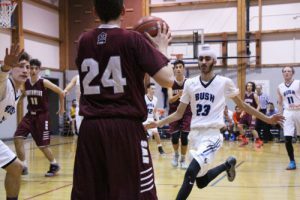 Pictured is a 10th grader wearing a patka during a basketball game. Erika Schultz, an award-winning staff photographer for The Seattle Times, added lecturer for the UW Department of Communication to her list of talents. In the 2016 Winter Quarter, Schultz taught “Journalism in a Diverse Society,” examining the important cultural roles of journalists in a society that is increasingly diverse. In the class, students investigate their own values, apply knowledge of stereotyping, respect authentic voices of sources, and strive to understand the cultural differences in creating journalistic content. For Schultz, the emphasis of the class is on photojournalism, but there is also an effort to highlight the broader goal of inclusivity. One of the students in the class was Sidney Sullivan and she covered an interfaith event in Seattle, Washington. 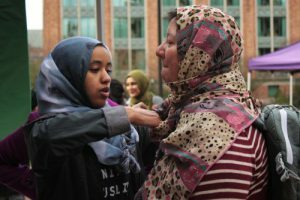 In the photo she took for her final portfolio (pictured right), Medina Khedir is seen assisting a participant in securing a hijab in early 2016. All women, both non-Muslims and non-Hijabi Muslims, were encouraged to experience the hijab for however long they felt comfortable. “I am happy that I enrolled in this photojournalism course, because I am walking away with very valuable skills that will only help me grow as a journalist,” Sullivan said. Schultz will be returning to the UW in Autumn Quarter 2016 to teach the class again. “It is such an honor to come back and work with the students again,” she said. All students enrolled in the class are featured in a Tumblr blog that you can find here.